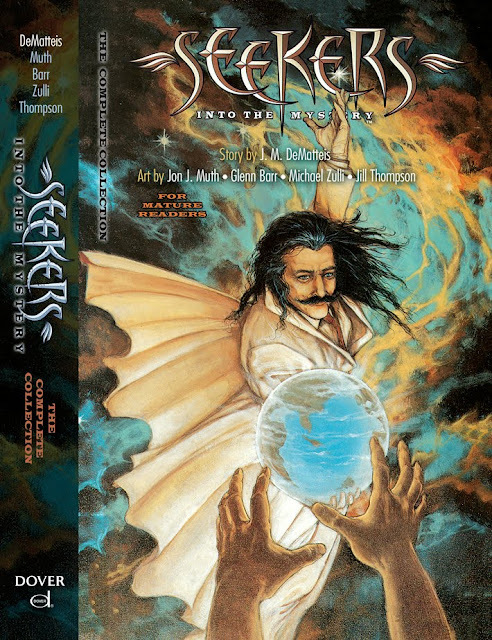 Next week will see the release of Seekers Into The Mystery: The Complete Collection from Dover Books. This is the first time all fifteen issues of Seekers—a series I'm very proud of—have been collected in one volume. The book contains lots of extras, including a brand new introduction by your truly—which you can read below. Enjoy! Then I forgot about it. Not surprising. I think almost every writer has stories he or she gets wildly excited about and then files away and forgets. But I knew this one would be back. I just wasn’t sure when. In 1994, I was on retreat at the Meher Center in South Carolina when the story started popping up again—and this time there was no stopping it. I began to see that the framework that had appeared in my head four years earlier would allow me to tackle all my passions, all the issues in life that excite, agitate, illuminate and consume me. My tale would start with one man: a pilgrim, a seeker, whose life unravels, opening first into unbearable mental agony—then ineffable spiritual wonder. And through him we would encounter other seekers, other worlds, all unfolding onto a new world, a new Age. I saw how this novel—I was still thinking of it as a book roughly the size of War and Peace—could encompass all the strange, disturbing and miraculous things happening—psychologically and spiritually—on the planet. I pitched the project to my old friend Karen Berger, the visionary behind DC Comics’ Vertigo imprint, and she immediately, and enthusiastically, approved it as a monthly series. Before long I was working with Shelly Roeberg (these days she’s Shelly Bond—and still one of the best editors, and nicest people, in the business) and, together, we came up with the idea of using not one, but a roster of artists to bring Seekers Into The Mystery (the title got significantly longer, for reasons too complex to get into here) to life. The first two we signed up were favorite collaborators of mine: the brilliant Jon J Muth, who illustrated Moonshadow—the project that helped me find my voice as a writer—and the equally-brilliant Glenn Barr, who illustrated my thinly-veiled autobiography, Brooklyn Dreams. But that, I thought, was just the beginning: I had ideas for another three years of Lucas Hart’s journey. There were many more themes to strike, characters to explore, ideas to develop. But publishing, like life, takes unexpected turns and Seekers Into The Mystery ended with its fifteenth issue. We had enough warning that I was able to write something resembling a finale, but it wasn’t the ending I had in mind. When a series ends, a writer (well, this writer) tends to go into mourning; but then you move on to the next story, and the next, trying not to look back with regret. (You try, but it doesn’t always work.) What helped me with the death of Seekers was the fact that many people who read the series took it deep into their hearts. It mattered to them. In some cases it changed them, in profound ways. And, as the years have passed, I continue to hear from readers who embraced Lucas Hart’s journey and found in it a reflection of their own. A writer (well, this writer) can’t ask for anything more. I’ve waited a long time to have all fifteen issues of Seekers Into The Mystery collected in a single volume and words can’t express how delighted I am that it’s finally come to pass. Whether you’re revisiting these stories or encountering them for the first time, I hope you enjoy this long, strange trip into the mystery. One of the things I loved about the series was that it was about hope, about growth, about self-understanding ... and it was about a sacramental approach to life. Even an agnostic like myself (lapsed but still in many ways a cultural Catholic) found much to love in the series. I was sorry to see it end so soon, long before you could tell the entire tale, and I'd hoped you might continue it some day. But the creative energies & passion do move on to other things, don't they? But I'm delighted to see those 15 issues gathered together at last. It was one of the comics I most looked forward to in those days -- even when I occasionally disagreed with some idea or another in its pages, it always made me think & feel. And as always, you made it entertaining, often laugh-out-=loud-funny, without losing any of the substance. If anything, humor gave it even more gravity, in a way. Thank you, Tim. It means a lot to me knowing that SEEKERS found a way into your heart. I tried to make Lucas and his world as real as possible, with all the heartbreak and humor, struggle and cosmic wonder that life offers. I'm sure I didn't always succeed, but it was a wonderful ride for me as a writer and a person. Thanks for checking in, Tim. Always happy to hear from you. I raise a glass to the Romantic Agnostics! But anyway, good luck in your future endeavors, I hope 2017 can bring us a Moonshadow collection and another story from you exploring themes of identity, self discovery, loneliness, religion and the search for meaning. Thanks for the kind words, Shade. The projects you mention are among my favorites. And, yes, Fernando is a wonderful artist (and a wonderful collaborator) and I'm happy that he's been getting praise for his recent work on MIDNIGHTER AND APOLLO at DC. What have I been up to lately? Along with my animation and other TV work, I just wrapped up a creator-owned project at IDW called THE ADVENTURES OF AUGUSTA WIND: THE LAST STORY (a sequel to my first AUGUSTA WIND series), which I consider one of the best things I've ever done. And it's very much about the search for meaning, although presented in the guise of an all-ages fantasy. Keith Giffen and I are co-writing SCOOBY APOCALYPSE at DC (with another collaboration in the offing). I'm just starting work on IMPOSSIBLE, INC: a new creator-owned series for IDW with my friend Mike Cavallaro. It will be out late in the year, so I'll keep details under wraps for now. Re: a new MOONSHADOW collection. We're actually in talks about that right now—a big, hardcover collection with lots of extras—so I'm hoping we'll have it out before the end of 2017. Hope you enjoy SEEKERS INTO THE MYSTERY, Shade, and thanks again for taking the time to connect and share your thoughts! Anyway, I guess I'm rambling now, but I just really like your writing and I just hope to see more of it. Regarding Moonshadow, I really hope 2017 is the year, I remember talks of a hardcover with extras two years ago... I hope it materializes this year. Hope you have a busy and lucrative year, best of luck. Did you read both AUGUSTA minis, Shade, or just the first one? In any case, glad you enjoyed it. Re: Black Mask. That project is on hold for now, unfortunately. Re: MOONSHADOW. It's looking like it's really going to happen, in a nice hardcover stuffed with extras. I don't recall any talk about it previously, beyond my own wishful thinking. But we've got an excited publisher and an enthusiastic editor on board. Once we're done with negotiations, I'll be able to talk about it more freely. I love Deadman. I'd write the character again in a heartbeat! I read both of them almost back to back last year. I thought you said you were in talks about a Moonshadow collection 2 years ago but maybe I'm just not remembering it right and it was just wishful thinking. I hope this new collection reaches new fans that have never read it before, it's quite the journey. Sad to year about the Black Mask project, but I really hope you get more comic book work in 2017 than in 2016. Alex Antone recently tweeted that the Deadman mini DC did recently was a success, especially since the cost was low and he also said they have more plans for Deadman stuff so here's hoping. I just hope he wasn't talking about JLD ugh... DC really needs to stop trying to make it happen. That title had you, Peter Milligan, Ray Fawkes and Jeff Lemire on writing duties and it still couldn't be great... Like, I didn't even hate any of the runs and there were certainly moments I liked but overall the concept doesn't work, some of the characters work in completely different tones and when put together they all get yanked from their comfort zone and become very watered down. You and Peter Milligan are two of my favorite comic book writers of all time and the fact that you couldn't make it work says a lot about it, but like I said, the concept of "Justice League but with magical lasers and magical shields instead of super strength and flying" is stupid and doesn't play to the strengths of the characters, and DC has a lot of interesting magic characters like Constantine, Phantom Stranger, Swamp Thing, Ragman, Deadman, Black Orchid, Dr. Occult, Mr. E, Kid Eternity, Madame Xanadu, Dr. Fate, Spectre(and many more) that I'd prefer to see in a solo ongoing or mini. I love all those characters, Shade—which is why I loved writing JLD. I could pull in anyone I wanted. The DC Supernatural Universe is rich with some of the best characters in comics and I'd love to see them all exploited more.